The Village of Hudson failed to post the agenda for tonight’s meeting on their website 48 hours in advance. It was finally posted to the website sometime yesterday. The Agenda that was posted on the door of the Water Departments is different than the one now posted on the Village website!. Since it wasn’t legally posted 48 hours in advance, it is an illegal meeting. 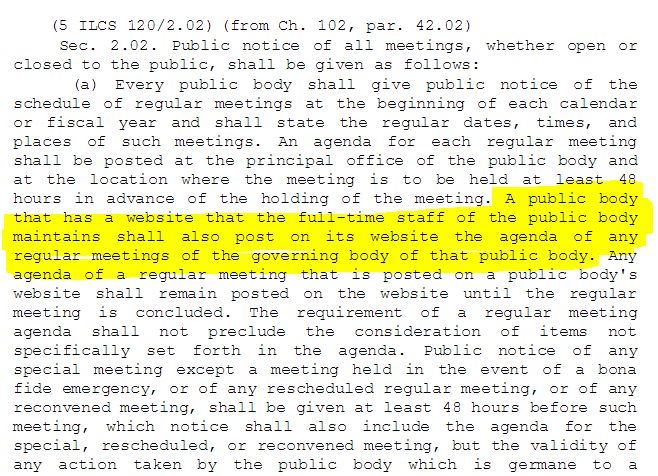 Changing the agenda less than 48 hours before the meeting also makes it illegal. These trustees were elected by the few people who bothered to vote in Hudson – what is there to discuss? What is there to vote on? Does the Board realizes trustees are elected to represent the people – not the Board. The Board has no valid reason to “vote” on incoming trustees! I hear Hudson patterned their ordinances after Normal, but the Board doesn’t live in Normal. There must be a reason they don’t live in Normal – why are they trying to imitate them? This comment was made after another Secret Meeting that cleared the room of citizens. When the Board returned to open session nobody was still there to hear it. If they are really meeting on July 4th, citizens need to be there. Maybe they are counting on you NOT attending. Posted in - - - Please Contribute - - -, BloNo, elections, Local, Progressives.Tagged agenda, Hudson Il, Jason Collins, OMA, Open meetings Act, Village Board. Looks like Hudson is becoming quite the corrupt little town, doesn’t it? A “Bedroom of Bloomington” in more ways than one! I believe you have been give misleading information. The agenda was posted in public 48 hours in advance. This is a community of less than 2000 and the public notice has always been at the Water House. Posting it also on the web site is irrelevant to the statute. Second, the statue pertaining to the appointment of Legal Council was changed in a prior meeting and sent to be certified and added to the online Certification of Statutes. That does not mean it is not actionable. I think someone is feeding you questionable, misleading information in order to try to discredit the Trustees. That doesn’t explain a different agenda on the website and the one posted. The website is not irrelevant – it’s right in the OMA statute. Thanks for confirming why your mayor quit. Don’t agree with rules – change them. Don’t like your lawyer’s advice, get a new one. I will add a copy of the statute on websites to the post. Yes, that would be nice. Please read the part about full time web administrator, which Hudson does not have. And the statue is changed. Why the “Thanks for confirming why your mayor quit”? I only know what was in the letter so I wonder who you are talking to. And that is not meant snarky. There is always more to the story. It says full time staff – not web administrator. They post to a Google Drive, not rocket science. There is more to the story – so far that part of the Collins letter has been redacted. If I have to file a lawsuit to get an un-redacted copy I will. Neither of the office people are full time. Sorry I wasn’t as clear as I should have been. I do not understand why you are so interested in this. And what was redacted was something that involved a closed session. A resignation letter has nothing to do with a closed session. The mayor quit, the people of Hudson deserve to know why – from the letter he wrote! I can take the staff not being full time as an excuse, not a good one since it was eventually posted to the website before the meeting. May I ask why my comment did not pass Moderation? Because I just got it!